ELLSWORTH, Maine — As invasive green crabs continue to upset the ecological balance of many parts of coastal Maine, a group of Mainers has geared up to try to curtail the crustaceans in Frenchman Bay. With the help of a $6,000 grant from the Maine Community Foundation, researchers and clammers hope to identify effective methods for catching the crabs and places where trapping efforts might have the most immediate results. Joe Porada, a shellfish harvester and aquaculture grower, is chairman of the Frenchman Bay Regional Shellfish Committee, which received the grant. The group is comprised of several towns surrounding the bay that cooperatively manage their tidal shellfish fisheries. Porada said Thursday that the invasive crabs are not as prevalent in the bay as in 2013, but they are still there. Last year, when the crabs took a heavy toll on clams and marine grasses in the bay, he said, he would encounter “tens of thousands” of the crabs in a day’s work. “We saw places last year where almost all the juvenile clams were eaten,” Porada said, adding many adults clams were, too. The “explosion” of the crabs’ population, and their taste for shellfish and marine grass, he said, directly threatens Maine’s $16.9 million annual softshell clam fishery. By reducing coastal habitat for the young of other commercially fished species, including lobster, the crabs could have an adverse impact on other fisheries as well, he added. 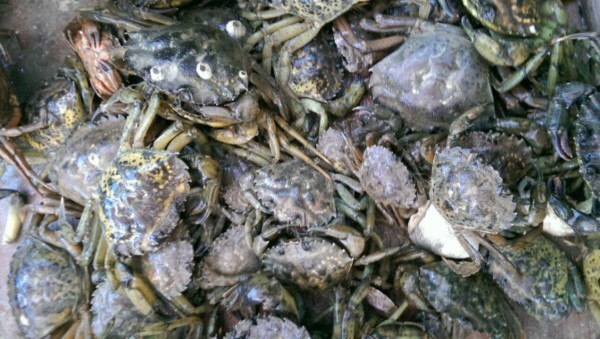 Fishermen in the tidal Bagaduce River in western Hancock County also have indicated that the number of green crabs there has been much lower in 2014 than preceding years. In Casco Bay, where the crab invasion has been acute, the estimated number of crabs has been lower this summer but still similar to what they were in 2012 and 2013, officials have said. Porada said that, to the extent that the crab numbers have declined, officials and fishermen think a colder winter and spring may have helped. But if average water temperatures in the Gulf of Maine continue to rise, as many scientists say is likely to be the case, they are expected to return in heavy numbers. Fishermen and area officials want to be proactive, he said, which is why they applied for funds for the Green Crab Control Project. Researchers with the University of Maine, College of the Atlantic and Mount Desert Island Biological Laboratory are partnering with the regional shellfish committee in the study. Porada said four traps of varying design will be placed in coves around the bay to try and determine which traps and locations are most effective for catching crabs. Part of the project will look into which coves can be the most productive for shellfish with efficient trapping efforts, he added. He said the traps will be set out for about six or more weeks, likely through the end of September. Researchers then will go through the data and, sometime next winter, report back to the committee and partner scientists about their findings. As the Frenchman Bay project gets under way, the state has relaxed restrictions on harvesting green crabs with the shared goal of putting a dent in their numbers. As of this past Sunday, Maine Department of Marine Resources changed regulations to allow licensed lobstermen to harvest and sell green crabs without a separate green crab license and to eliminate reporting requirements for green crab catches. Lobstermen also can keep green crabs as bycatch, which they were not allowed to do previously. State regulations also were changed to allow green crab harvesting in the the Damariscotta, Medomak and Sheepscot rivers each winter, from Dec. 1 until April 30, when fishing for other crab species in those rivers is banned. “The considerable adverse effect of green crab predation on Maine’s valuable shellfish population has increased the importance of streamlining and improving DMR regulations regarding the harvest of green crabs,” department officials wrote in the official published notice about the change in rules. Porada said it is not possible to completely drive green crabs out of Frenchman Bay or Maine. But studies in Canada have shown that clam flats and marine grass beds can be restored with effective, ongoing trapping efforts, he said.